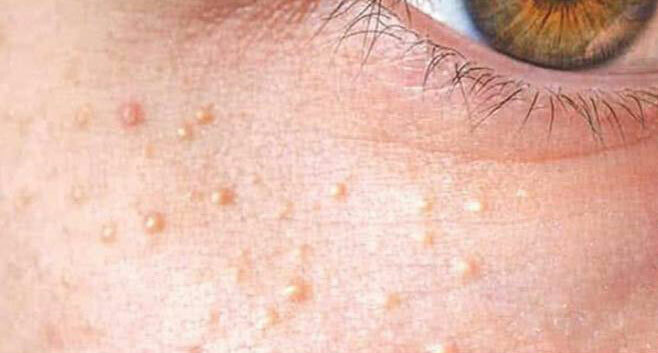 Milia are tiny, hard, white dots located under the upper layer of the skin. Often found around the eye area, cheeks, nose and chin. These occur when keratin/dead skin cells become trapped under the skin. Milia are treated by applying the heat energy of electrolysis to them. After treatment the surrounding skin may appear red and feel warm for a few hours. A tiny, pin-dot crust will form which will heal and fall away, usually within 7-10 days. This will not leave a mark. Usually between 1 and 3 treatments are required depending on how well the milia respond. The minimum charge is £40 and price may increase depending on the amount/size of milia to be treated. For 2-3 days after milia removal, bathe the area in cool water only. Avoid the use of perfumed products on the skin e.g. Soap, cleanser, moisturisers etc. each time the area is bathed apply a small amount of Aloe Vera gel to soothe the skin and aid the healing process. DO NOT PICK OR SCRATCH. Leave the area to heal naturally.